Meet & Greet during the afterhoon. We will keep you informed here. Admittance: The Marathon starts with the first tanda. Dinner will be served. Of course you are free to dance on and eat the leftovers at a later time. An evening and night full of dancing lies behind us. In nine hours the Marathon will continue. We start the new round off with a delicious brunch. Dance or eat, whatever takes your fancy. along with tea and coffee. Food again at last. Dinner is ready. We are letting our legs rest. 12 h Again, we will start off the day with a brunch. 15 h Teatime again. Coffee, tea and sweet snacks are served. 18 h The 2nd Queer Tango Marathon in Munich has come to an end. 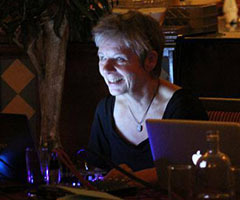 She started to DJ in 2004, and founded her own milonga in 2005 in Munich, that takes place once a month under the name “Bailongo”. When she plays music, she draws on the richness of the traditional tango music. Her stylistic focus is on subtle, sophisticated, sometimes cheeky music as opposed to bombastic, big drama stuff. This is her motto: Music that is upbeat but not hectic, calm but not monotonous, romantic but not overblown - music that gets directly into the feet! 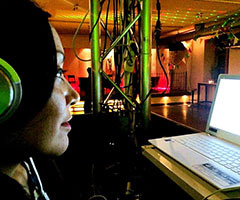 She DJs in milongas and special events in many parts of Germany, in the Netherlands, Belgium, Sweden, Switzerland, Austria, Slovenia, Spain, and Buenos Aires. Flavia Cristaldo was born in La Boca/Buenos Aires. For a long time she gave her attention to Tango Argentino which became her profession. As a dancer and Tango teacher, she is travelling to Sweden, Norway, Finland, Czechia, Italy, Japan and Germany. Exploration of the body, energy flow and creativity is the basis of her work. She teaches to respect each other, to lead and to follow. For love of Tango music and the Tango lyrics, she starts to collect compilations of the best DJs of Buenos Aires. This music she plays at international milongas. the Queer Tangoscene in Munich has been known him as a visiting teacher for some years. He also takes care of this website and the registrations for this marathon. He is (co-) organizer of the Kuala-Lumpur Tango Festival and the Gothenburg Queer Tango Mini Festival and hosts the regular queer MilongAMIGÅ in Berlin, where he also lives and teaches. In the classroom he tries to convey to his students clarity in the movement. When he plays music he chooses music with a clear rhythmic structure, which gives the dancers a solid framework for their dance interpretation. is dijing in and outside of Germany since 2000. Most important for him is to fit the energy and mood of the music to the situation on the dance floor, so the evening is developing spontaneously. Mostly traditional in the tanda-format TTVTTM, he also plays neo tangos or non tangos. The main principle however is always that those songs are danceable. He sees the task of a DJ to entice the dancer to stay on the dance floor for the whole time while having a lot of fun. Esequiel Maiolo, Argentine, settled 10 years ago in Munich. He is a dancer, teacher, DJ and producer of tango. Feeling the music through his body, gives him sensitivity and connection with the public. Versatile and innovative. He has an inventory of classics and neos according to the occasion. His avant-garde vision leads him to create a new production company and school with his family: "Dna Tango"
born in the city of Rosario, Argentina, is an Argentine tango dancer and teacher. 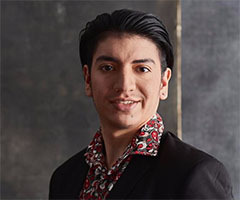 Axel’s dancing career began at 14 years and as a teenager he had already performed on stage sharing the floor with Roberto Herrera und Laura Legazcue. Based in Munich now and together with his partner, Axel is traveling to many European countries, such as Greece, Austria, UK and Italy for teaching, performing and competing, reaching into the best 15 couples in the UK Tango Championship. His energy and authentic style is not only admired in his dancing, but also in his taste of music. 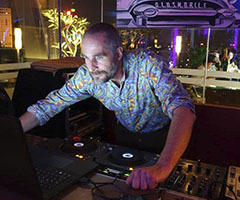 As a tango DJ, his selection lies between the music of the EDO (Epoca De Oro = Forties) and new young orchestras that give the old favorite songs a new energy.